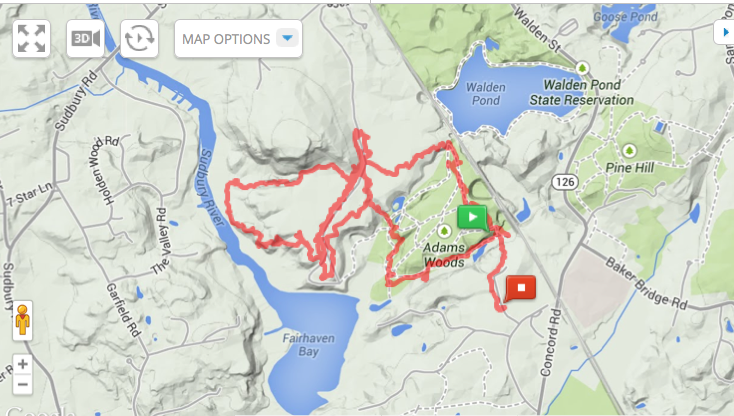 Tomorrow we’re hunting the territory near Walden Pond. We did a reconnaissance of the trails today and expect to cover about 7 miles during the hunt. The trails are clear and the weather should be just about perfect. Tomorrow I am leading the Hilltopper field for the hunt — so today I went out to ride the territory so I don’t get lost. It’s one thing to get lost when out on your own or with a friend or two; it’s an entirely different matter when you are leading a field full of riders! Luckily when you are drag hunting you know where the scent will be laid, so you can pick your “course” in advance. Leading the Hilltoppers is fun, but can be challenging. As the field leader, you set the pace and it’s inevitably too fast or too slow (simultaneously!) depending on whom you ask. If you ride first flight, there’s no question about how you will ride: fast. Many times when we have guests, they ride in the Hilltopper field so that they can experience hunting in a more controlled manner and without the added excitement of jumps. But some of them have never hunted before, so you also need to make sure that everyone gets back to the trailers and hopefully has a wonderful time. There are sometimes a few surprises — horses that don’t behave quite as expected, ground bees that make an unwelcome appearance, or hounds that get on the scent of deer. After riding Freedom on the trial run today, I’m going to lead the field with Zelda. He’s still too amped up and will just be mad if I try to make him go more slowly. His idea of hunting is to gallop and while he will lead the slower field if I ask him, it may not be pretty, especially during the times when he can see the first field ahead of us. Zelda is far more amenable to a more leisurely pace (I hope). I know this territory pretty well, and left a few discrete markers on the turns that are confusing. So, fingers crossed that I won’t get lost, that Zelda will behave and that I’ll bring my field back to the trailers with big grins on their faces! Who says OTTBs don’t make good trail horses? I just discovered a foxhunt in Southern California! I called to see if I could guest later this fall. If it works out, it will be exciting. I only fox hunted once when I was 12. I have not forgotten that lovely afternoon. I hope you get to go. Foxhunting is really just too much fun. I led a small field today and had two ladies who are just starting out so we kept it on the slow side but everyone had a great time! So glad your fox hunt went well. I was able to follow in a car several years ago when my daughter went on a hunt. It was a glorious cold day – and the horses and riders looked so beautiful as they entered a clearing with the heat rising from their bodies creating a fog. There were definitely lots of grins.